Water clarity is a constant battle and Alum is a reliable water clarifier that is made from Aluminum Sulfate. It works by dropping unwanted particles, phosphates, metals and impurities to the bottom of the pool to be vacuumed later for quick and permanent removal. 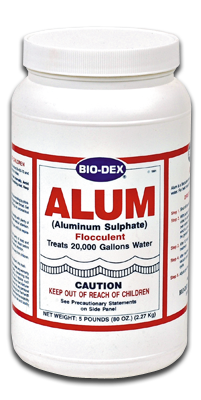 Bio-Dex Alum is a flocculant water clarifier that drops unwanted debris and phosphates to the bottom of the pool to be vacuumed later. 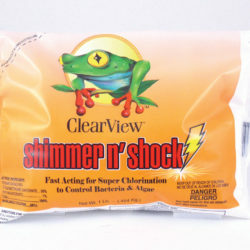 This is the best product to use when water is saturated with heavy metals. Bio-Dex Alum application is a ratio of one five pound jar to treat 20,000 gallons of water. First, adjust the water pH to 7.2 to 7.6 while the pool filter is running. Slowly pour one scoop of Alum in the skimmer while the filter is running. Broadcast the rest of Alum across the surface of the pool. Wait two hours or until the pressure gauge on the filter increases by 5 psl. Turn the filter off and let the dirt and debris fall to the bottom of the pool. This process could take up to ten to twelve hours. Vacuum the sediment at the bottom of the pool. Do not vacuum to the filter. 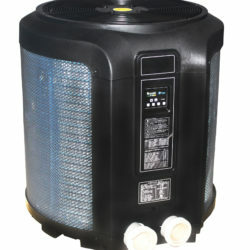 Backwash the system until the water runs clear or clean the filter. Turn the circulation system back on. 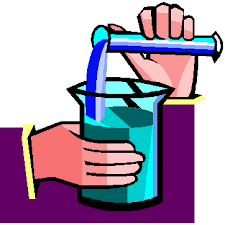 Adjust the water pH to 7.4-7.6 and the total alkalinity to 80-120 ppm depending on the sanitizer you are using. A second application may be needed for extremely dirty water.